A 10-step procedure to help you prepare, select, evaluate, interpret and report on studies in your systematic review of patient-reported outcome measures (PROMs). Systematic reviews of outcome measurement instruments are important tools for selecting the most suitable instrument to measure a construct of interest in a specific study population. High quality systematic reviews can provide a comprehensive overview of the quality (i.e. measurement properties) of instruments and supports evidence-based recommendations for the selection of the most suitable instrument for a given purpose (i.e. research or clinical practice; or discriminative, evaluative or predictive applications). Systematic reviews of outcome measurement instruments differ from reviews of interventions and diagnostic test accuracy studies and are complex. In fact, multiple reviews (i.e. one review per measurement property) are included in a review of one or more PROMs. The COSMIN methodology is developed specifically for PROMs. It can also be used systematic reviews of other types of outcome measurement instruments, such as clinician-reported outcome measures and performance-based outcome measures, but it may need to be adapted for these purposes. We developed a consecutive ten-step procedure for conducting a systematic review specifically for patient-reported outcome measures. Steps 1-4 concern preparing and performing the literature search, and selecting relevant studies. 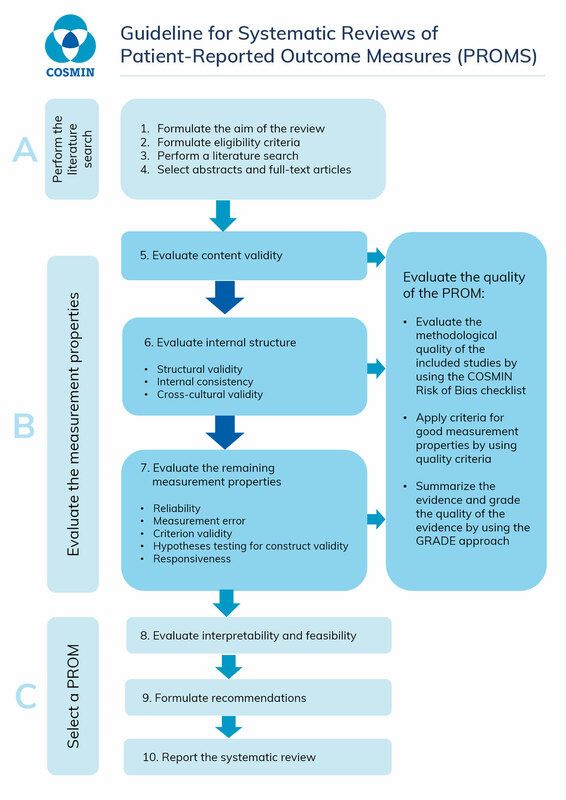 Steps 5-8 concern the evaluation of the quality of the eligible studies, the measurement properties, and the interpretability and feasibility aspects. Steps 9 and 10 concern formulating recommendations and reporting the systematic review. A comprehensive user manual is written on how to conduct these ten steps in a systematic review of PROMs. In step 5 the content validity of an PROM is determined. As this is a very important and complex step to take, we wrote a separate user manual for assessing content validity of PROMs.